There are many alternatives to xanthan gum or guar gum. Whether it is due to preference, or a sensitivity, here are a few options to use in your gluten-free baking. Agar Agar, or more simply known as Agar, is derived from red algae. It is 80% fiber and can have a laxative effect. Agar is a vegan alternative to gelatin. Agar is available as a powder, flakes, or in bar form. When used with restraint, agar can make doughs more stretchy and elastic. Too much can make breads and cakes chewy and soggy. Agar is tasteless and odorless. Agar powder can be used as a replacement for gelatin, typically 1:1. For 1 teaspoon of gelatin, you can use 1 teaspoon of agar powder. More will be needed if using agar flakes, roughly 3 times more. Agar should be dissolved in boiling liquid before adding to a recipe. Allow the agar/liquid mixture to boil for 5 minutes for powder or 15 minutes for flakes before using. It will set as it cools down and will even set at room temperature. Agar will set more firmly than gelatin, which will impact the texture of baked goods. Some fruit decreases agar’s ability to gel and some prevent it from gelling altogether. Check out One Green Planet for a full list of these fruits. Chia Seeds can be used as a replacement for xanthan gum in baked goods such as breads, pastries, and cakes to improve the consistency and add moisture. It is high in fiber and may have a laxative effect. Chia seeds can be used 1:1 by weight for xanthan gum. To make this substitution, soak chia seeds or ground chia seeds in water for a few minutes to form a gel before adding it to the recipe. You should use 3 times the amount of water as chia seeds. The baking time may need to be increased by up to 15 minutes when using chia seeds. Egg Whites can be used to replace xanthan gum. Replace 1 tablespoon of xanthan gum with 1 egg white. Eggs are readily available and used in most baked goods, making this a readily accessible substitute. However, since eggs are used for leavening as well as binding, the final product will have a higher rise. Flaxseed is a good replacement for eggs in recipes. It is not elastic and will not make a good substitute for xanthan gum in products such as bread that require elasticity. 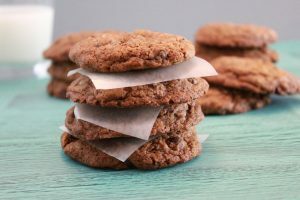 Instead, use flaxseed to replace xanthan gum in baked goods that do not require elasticity, like cookies. It makes a good replacement for eggs in nearly all baked goods. Flaxseed can be used 1:1 by weight for xanthan gum. Flaxseed should be ground and then mixed with boiling water to form a slurry before adding it to the recipe. Use two times the amount of water as flaxseed. Psyllium Husk Powder can be used as a binder and to add moisture to a recipe. It is high in fiber and may have a laxative effect. It can add rise and improve the texture of bread and similar baked goods. Psyllium should be used 2:1 for xanthan gum, meaning twice as much psyllium is needed. Another rule of thumb is 5% of the recipe flour should be psyllium. Meaning 19 parts should be flour, and 1 part psyllium. Gelatin is made from animal-product, which means it is not a suitable substitution for vegans. It is widely available and is available in sheet, powder, or granular form. Gelatin should be substituted 2:1 for xanthan gum. Twice as much gelatin is needed than xanthan gum to achieve the same results. Carrageenan is widely used in prepared foods today as a thickener and emulsifier. It is derived from red seaweed and can be used as a vegan replacement for gelatin. Carrageenan can be used when making items such as ice cream and salad dressing. Carrageenan is FDA approved, though many are trying to change that. The safety of consuming carrageenan is widely debated. It has been reported to damage the digestive system, leading to various GI conditions. Due to the debatable safety of this food additive, it is best to avoid it. Konjac Root Powder, also known as Glucomannan, is high in fiber and may have many health benefits. It can be used for constipation relief and it is commonly used in pill form for weight loss. When ingested in pill or tablet form, it presents a choking risk. The pill can absorb water prior to reaching the stomach. It has also been known to lead to intestinal blockages. These risks have been reported when it is used as a weight loss supplement, but it is generally considered safe when used in food or baked goods. When in doubt, take with plenty of water, or avoid it entirely. Konjac root powder is a vegan alternative to gelatin and xanthan gum. It can be used as a replacement 1:1 for xanthan gum. “ADDING FLAXSEED TO BAKED PRODUCTS.” Ameriflax, www.ameriflax.com/default.cfm?page=mntech. Angela. “What Is Agar?” Vegangela, vegangela.com/2011/10/14/what-is-agar/. Boldt, Ethan. “BREAKING: Board Votes to Ban Carrageenan in Organic Food.” Dr. Axe, 4 Dec. 2017, draxe.com/what-is-carrageenan/. “Carrageenan: What Is It?” Food Science Matters, www.foodsciencematters.com/carrageenan/. “Everything You Need to Know About Agar.” Not Enough Cinnamon, 30 Sept. 2016, notenoughcinnamon.com/2012/08/02/everything-you-need-to-know-about-agar/. Fletton, Helen. “What Are the Alternatives to Xanthan Gum or Guar Gum?” What Are the Alternatives to Xanthan Gum or Guar Gum?, 30 Mar. 2014, www.wheat-free.org/what-are-the-alternatives-to-xanthan-gum-or-guar-gum.html. “How to Use Xanthan Gum to Replace Gelatin.” LEAFtv, www.leaf.tv/articles/how-to-use-xanthan-gum-to-replace-gelatin/. Lane, Chrissy. “How to Make Substitutions for Xanthan Gum in Baking.” Gluten Free Bread, 5 Nov. 2013, gluten-free-bread.org/make-substitutions-xanthan-gum-baking. Larsen, Linda Johnson. “Xanthan Gum Substitute.” LoveToKnow, gluten.lovetoknow.com/xanthan-gum-substitute. Moncel, Bethany. “What Is Agar-Agar?” The Spruce, 17 Feb. 2017, www.thespruce.com/what-is-agar-agar-1328461. Price, Annie. “This Natural Super-Fiber Powder Fights Fat, Diabetes & High Cholesterol.” Dr. Axe, 17 Aug. 2017, draxe.com/glucomannan/. Rimmer, Alyssa. “XANTHAN GUM: THE GLUTEN-FREE BAKER’S SECRET WEAPON.” Flourish – King Arthur Flour, 5 Aug. 2015, blog.kingarthurflour.com/2015/08/05/xanthan-gum/. Weil, Andrew. “Is Carrageenan Safe?” DrWeil.com, 1 Nov. 2016, www.drweil.com/diet-nutrition/food-safety/is-carrageenan-safe/. “What Is Carrageenan? Is It Dangerous?” Dr. Axe, 4 Dec. 2017, draxe.com/what-is-carrageenan/. “Why I No Longer Use Xanthan Gum.” Celeste’s Best, www.celestesbest.com/blog/why-i-no-longer-use-xanthan-gum-/ba707787-c8dd-08ff-43cb-53beade9b3ab.